Drew Dozier was one of nine Arkansas seniors to receive a 2019 Arkansas Sports Hall of Fame Scholarship. 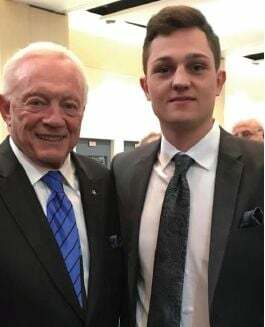 Drew received the Jerry Jones Sr. Scholarship at the 2019 Sports Hall of Fame Banquet at the Statehouse Convention Center in Little Rock on March 29th. Nine new Hall of Fame inductees were honored at the banquet, and Drew got to meet Mr. Jones and hear inspiring stories from inductees like Houston Nutt, Madre Hill, and Jerry Jones Jr. Congratulations, Drew!